Includes .22 Standard, Mark I, Mark II, Mark III and all Centerfire Semi-Auto Pistols. Finally got to the shop to pick up my P93DC. I was a little disappointed in the finish (at first). It just looks so different than any of my other stainless P pistols. I shot it, shoots fine. Went home and really got to wondering about the finish. I looked in Chad Hiddleson's Reference of Ruger Firearms, and I found that for a short time, Ruger applied what was called a Rem-coat (grey matte-like) finish to the receiver of some of their KP93 pistols. The books said this finish would be considered extremely rare as it was not used for very long, but was also produced concurrently with Ruger's standard stainless finish. It remind me of the "target grey" finish Ruger put on some of the Super Redhawks. So, what I was at first disappointed in, I am now pretty happy about!!! I will try to post a pic later, but I bought it off gunbroker, and the pics from there didn't really show the finish well. It just looked like regular stainless, so I doubt my cell phone pics will be any better. The 93 is top left. Very different finish than any of the others. It does look a lot like the target gray. It is a good score when you pick up a rare gun and it is a surprise. Great looking group of P series pistols. Great find and collection of P models! 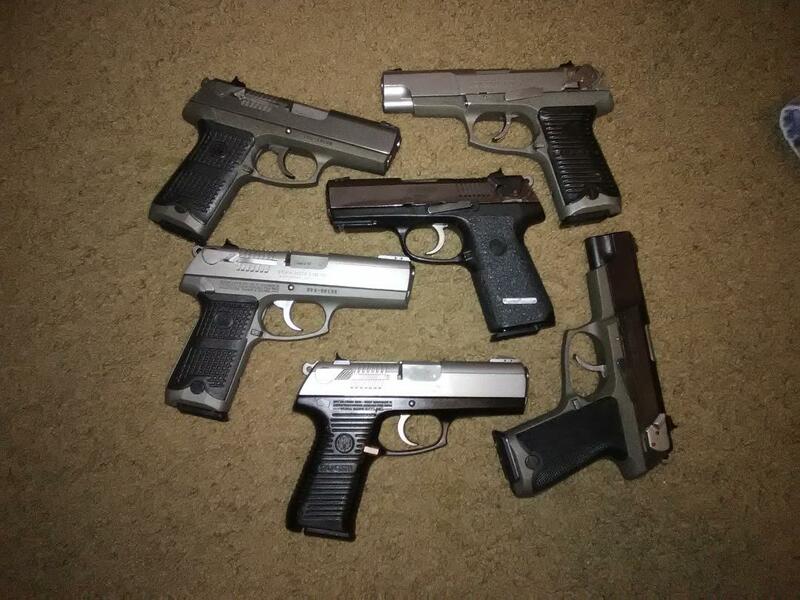 Nice collection of P-series pistols! I REALLY didn't need to be enticed into considering other Rugers to collect, but that pic sure does make me think I might need a few semis. One good thing about the P series, you can still find them relatively cheap! At least compared to collecting Old Model Blackhawks!